Just taught at the Sitka Center for Arts and Ecology last weekend. Absolutely incredible venue to teach through. My “Of the Land, Sea & Air – A Coastal Photographic Adventure” filled months ago, and had a waiting list. The students were great, and the wildlife made its appearance. The coastal weather was misty one day, and simply overcast the second day. Overall, a great experience to teach in, and a wonderful school to work with. The students photographed the Common Murre colony, fledgling Peregrine Falcons, Great Blue Herons, Black Oyster Catchers, Pigeon Guillemot, Black Guillemot and more. One student watched and photographed a Humpback Whale that was breaching. The following photographs are from the workshop. . . This Great Blue Heron was hunting on the in-coming tide. 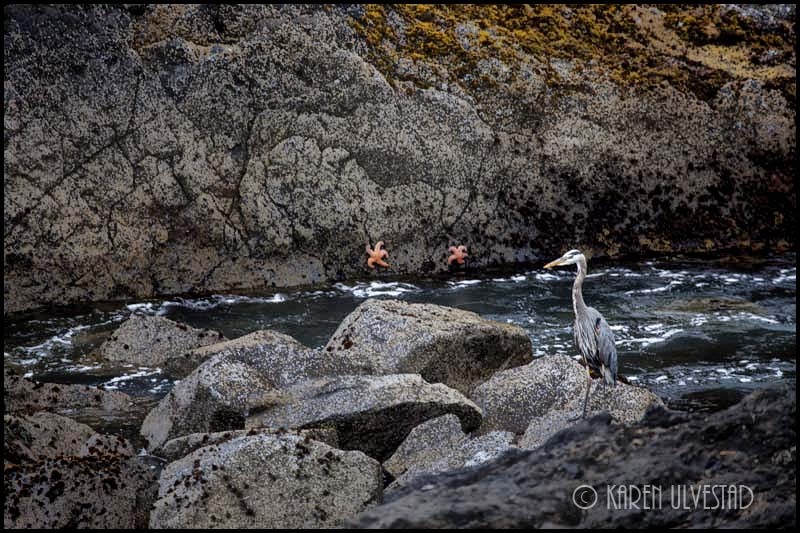 The mono-chromatic scene in off-set with the orange Starfish, green water and kelp. This is one of the fledgling Peregrine Falcons. 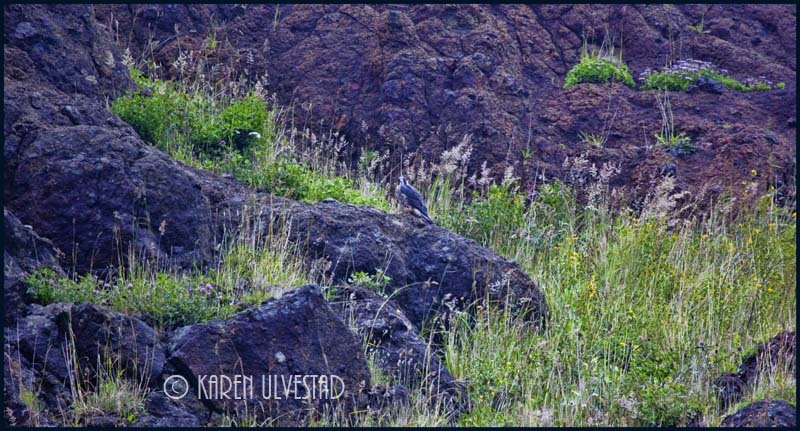 His coloring allows him to blend in with the rocks of the cliff-side. The day was over-cast, and can be seen in the white reflected off the top of the water. 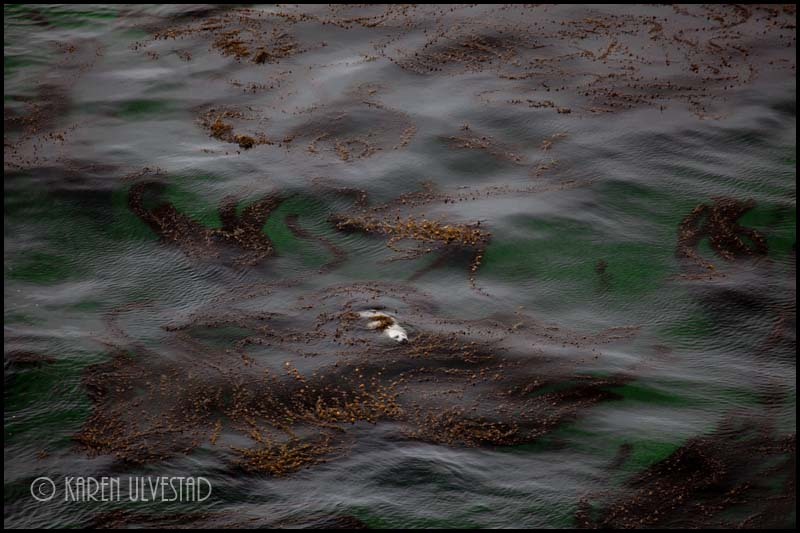 The Harbor Seal was swimming in the kelp beds (red), and the green ocean water. The kelp, water and cloud reflections make an abstract around the seal. Now that sounds like my kind of workshop! I think I will be offering it next summer too. I got invited back to teach again. As always – wonderful. Would love to join you!